Al-Zahrawi's principal work is the Kitab al-Tasrif, a thirty-volume encyclopedia of medical practices. The surgery chapter of this work was later translated into Latin where it received popularity and became the standard text book in Europe for the next 500 years. Al-Zahrawi's pioneering contributions to the field of surgical procedures and instruments had an enormous impact in the East and West well into the modern period, where some of his discoveries are still applied in medicine to this day. Few details remain regarding his life, aside from his published work, due to the destruction of El-Zahra during later Castillian-Andalusian conflicts. His name first appears in the writings of Abu Muhammad bin Hazm (993 – 1064), who listed him among the greatest physicians of Moorish Spain. But we have the first detailed biography of al-Zahrawī from al-Ḥumaydī's Jadhwat al-Muqtabis (On Andalusian Savants), completed six decades after al-Zahrawi's death. Frontispiece of the Latin translation of Al-Zahrawi's Kitab al-Tasrif. Al-Zahrawi's thirty-volume medical encyclopedia, Kitab al-Tasrif, completed in the year 1000, covered a broad range of medical topics, including on surgery, medicine, orthopaedics, ophthalmology, pharmacology, nutrition, dentistry, childbirth, and pathology. The first volume in the encyclopedia is concerned with general principles of medicine, the second with pathology, while much of the rest discuss topics regarding pharmacology and drugs. The last tretise and the most celebrated one is about surgery. Al-Zahrawi stated that he chose to discuss surgery in the last volume because surgery is the highest form of medicine, and one must not practice it until he becomes well-acquainted with all other branches of medicine. The work contained data that had accumulated during a career that spanned almost 50 years of training, teaching and practice. In it he also wrote of the importance of a positive doctor-patient relationship and wrote affectionately of his students, whom he referred to as "my children". He also emphasized the importance of treating patients irrespective of their social status. He encouraged the close observation of individual cases in order to make the most accurate diagnosis and the best possible treatment. Not always properly credited, modern evaluation of al-Tasrif manuscript has revealed on early descriptions of some medical procedures that were ascribed to later physicians. For example, Al-Zahrawi's al-Tasrif described both what would later become known as "Kocher's method" for treating a dislocated shoulder and "Walcher position" in obstetrics. Morover, Al-Tasrif described how to ligature blood vessels almost 600 years before Ambroise Paré, and was the first recorded book to explain the hereditary nature of haemophilia. It was also the first to describe a surgical procedure for ligating the temporal artery for migraine, also almost 600 years before Pare recorded that he had ligated his own temporal artery for headache that conforms to current descriptions of migraine. Al-Zahrawi was therefore the first to describe the migraine surgery procedure that is enjoying a revival in the 21st century, spearheaded by Elliot Shevel a South African surgeon. Page from a 1531 Latin translation by Peter Argellata of Al-Zahrawi's treatise on surgical and medical instruments. On Surgery and Instruments is the 30th and last volume of Kitab al-Tasrif. It is without a doubt his most important work and the one which established his authority in Europe for centuries to come. On Surgery and Instruments is the first illustrated surgical guide ever written. Its contents and descriptions has contributed in many technological innovations in medicine, notably which tools to use in specific surgeries. In his book, al-Zahrawi draws diagrams of each tool used in different procedures to clarify how to carry out the steps of each treatment. The full text consists of three books, intended for medical students looking forward to gaining more knowledge within the field of surgery regarding procedures and the necessary tools. The book was translated into Latin in the 12th century by Gerard of Cremona. It soon found popularity in Europe and became a standard text in all major Medical universities like those of Salerno and Montpellier. It remained the primary source on surgery in Europe for the next 500 years, and as the historian of medicine, Arturo Castiglioni, has put it: al-Zahrawi's treatise "in surgery held the same authority as did the Canon of Avicenna in medicine". "Before practicing surgery one should gain knowledge of anatomy and the function of organs so that he will understand their shape, connections and borders. He should become thoroughly familiar with nerves muscles bones arteries and veins. If one does not comprehend the anatomy and physiology one can commit a mistake which will result in the death of the patient. I have seen someone incise into a swelling in the neck thinking it was an abscess, when it was an aneurysm and the patient dying on the spot." In urology, al-Zahrawi wrote about taking stones out of the bladder. By inventing a new instrument, an early form of the lithotrite which he called "Michaab", he was able to crush the stone inside the bladder without the need for a surgical incision. His technique was important for the development of lithotomy, and an improvement over the existing techniques in Europe which caused severe pain for the patient, and came with high death rates. Throughout the text, Al-Zahrawi uses an authoritative tone to declare his expertise on the topic. For example, when introducing topics or describing procedures, Al-Zahrawi often warns the reader of the skills necessary to complete the task. In chapter forty-eight, "On cauterization for numbness", he defines the required knowledge for the procedure in a commanding tone: “This should not be attempted except by one who has a good knowledge of the anatomy of the limbs and of the exits of the nerves that move the body”. He invents a criterion to generate a standard of skill level, indicating that he himself has surpassed it due to training and experience. As such, he reiterates his preeminence by implying that he is part of an exclusive group of learned surgeons capable of correctly completing this cautery. In another instance, he states that the procedure should be avoided completely by incompetent surgeons: “However, no one should attempt this operation unless he has had long training and practice in the use of cautery”. Al-Zahrawi was not afraid to depart from old practice, for example, he openly disparages the opinion that cauterization should only be used in the spring season: “…the Ancients…[affirmed] that spring was the best. Myself, I say that cautery is suitable at all times”. Four pages later, he again opposes the opinion that gold is the best material for cauterization, stating that iron is actually his preferred metal: “therefore in our own opinion cauterization is swifter and more successful with iron”. In chapter twenty-nine, "On cauterization for pleurisy", he states: “Now one of the Ancients mentioned that there were some people who used an iron cautery shaped like a probe, and introduced it red hot into the intercostal space until it reached the abscess itself and evacuated the pus…but in this perforation with the cautery there is a danger either that the patient may die on the spot or that an incurable fistula may rise in its place”. In pharmacy and pharmacology, Al-Zahrawi pioneered the preparation of medicines by sublimation and distillation. He dedicated the 28th chapter of his book to pharmacy and pharmaceutical techniques. The chapter was later translated into Latin under the title of Liber Servitoris, where it served as an important source for European herbalists. The book is of particular interest, as it provides the reader with recipes and explains how to prepare the "simples" from which were compounded the complex drugs then generally used. Al-Zahrawi also touched upon the subject of cosmetics and dedicated a chapter for it in his medical encyclopedia. As the treatise was translated into Latin, the cosmetic chapter was used in the West. Al-Zahrawi considered cosmetics a branch of medicine, which he called "Medicine of Beauty" (Adwiyat al-Zinah). He deals with perfumes, scented aromatics and incense. He also invented a perfumed sticks rolled and pressed in special molds, perhaps the earliest antecedents of present-day lipsticks and solid deodorants. In the 14th century, the French surgeon Guy de Chauliac quoted al-Tasrif over 200 times. Pietro Argallata (d. 1453) described Al-Zahrawi as "without doubt the chief of all surgeons". Al-Zahrawi's influence continued for at least five centuries, extending into the Renaissance, evidenced by al-Tasrif's frequent reference by French surgeon Jacques Daléchamps (1513–1588). The street in Cordova where he lived is named in his honor as "Calle Albucasis". On this street he lived in house no. 6, which is preserved today by the Spanish Tourist Board with a bronze plaque (awarded in January 1977) which reads: "This was the house where Al-Zahrawi lived." Wikisource has the text of the 1911 Encyclopædia Britannica article Abu-l-Qasim. ^ Hamarneh, Sami Khalaf; Sonnedecker, Glenn Allen (1963). A Pharmaceutical View of Abulcasis Al-Zahrāwī in Moorish Spain: With Special Reference to the "Adhān,". Brill Archive. p. 15. Meri, Josef W. (2005). Medieval Islamic Civilization: An Encyclopedia. Routledge. p. 783. "The greatest surgeon of the medieval ages was Abu'l-Qasim az Zahrawi (d. 1010), a most important representative of the Andalusian school." Weinberg, Steven (2015). To Explain the World: The Discovery of Modern Science. Penguin Books Limited. "al-Zahrawi (Abulcasis) was born in 936 near Cَrdoba, the metropolis of Andalusia, and worked there until his death in 1013. He was the greatest surgeon of the Middle Ages, and highly influential in Christian Europe." Gerli, E. Michael (2017). Routledge Revivals: Medieval Iberia (2003): An Encyclopedia. Routledge. p. 12. "Book 30, on surgery, was translated in the twelfth century by Gerard of Cremona (Liber Alsahravi de cirurgia) and it established the reputation of Abulcasis as the greatest surgeon of the Middle Ages." ^ Krebs, Robert E. (2004). Groundbreaking Scientific Experiments, Inventions, and Discoveries of the Middle Ages and the Renaissance. Greenwood Publishing Group. p. 95." Al-Zahrawi (930 or 963-1013 C.e. ), also known as Abu-Al Quasim Khalaf ibn'Abbas al-Zahrawi, was a court physician. He was known for his practice of surgery as well as medicine. Sometimes referred to as the "father of surgery,""
^ Estreicher, Stefan K. (2006). Wine: From Neolithic Times to the 21st Century. Algora Publishing. p. 46. "Al-Zahrawi (936-1013), better known as Albucasis, writes a 30-volume medical encyclopedia and designs modern-looking surgical instruments. Many consider him the father of surgery." ^ "Abū al-Qāsim | Muslim physician and author". Encyclopedia Britannica. ^ Hamarneh, Sami Khalaf; Sonnedecker, Glenn (1963). A Pharmaceutical View of Abulcasis Al-Zahrāwī Moorish Spain: With a Special Reference to the "Adhān". Brill Archive. p. 15"The incipit to the seventeenth treatise in these manuscripts gives al–Zahrawi the additional title of "al–Ansari," the physician. From this, one could infer that al–Zahrawi is the scion of "al–Ansar, the people of "al–Madinah". and hence the nickname "al–Ansari.". ^ Hamarneh, Sami Khalaf; Sonnedecker, Glenn (1963). A Pharmaceutical View of Abulcasis Al-Zahrāwī Moorish Spain: With a Special Reference to the "Adhān". Brill Archive. p. 15. "Al-Zahrawi's ancestry then, one might infer, goes back to the Arabian Peninsula, to the inhabitants of "al-Madinah," the first city that accepted the message of Islam." ^ Missori, Paolo; Brunetto, Giacoma M.; Domenicucci, Maurizio (7 February 2012). 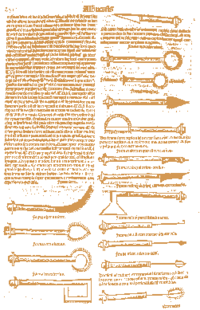 "Origin of the Cannula for Tracheotomy During the Middle Ages and Renaissance". World Journal of Surgery. 36 (4): 928–934. doi:10.1007/s00268-012-1435-1. PMID 22311135. ^ Aschoff, A; Kremer, Paul; Hashemi, Bahram; Kunze, Stefan (1999). "The scientific history of hydrocephalus and its treatment". Neurosurgical Review. 22 (2–3): 67–93, discussion 94–5. doi:10.1007/s101430050035. PMID 10547004. ^ "Theoretical and Practical Book by Al-Zahrawi". 1519. ^ Karagِzoğlu, Bahattin (2017). Science and Technology from Global and Historical Perspectives. Springer. p. 155. "This last volume is a surgical manual describing surgical instruments, supplies, and procedures. Scholars studying this manual are discovering references to procedures previously believed to belong to more modern times." ^ Fleischer, Aylmer von. Moorish Europe. Aylmer von Fleischer. "His work, Al-Tasrif, later translated into Latin by Gerard of Cremona, became the standard medical text for European Universities such as those at Salerno and Montpellier. This work was widely used by European medical practitioners for centuries." ^ Castiglioni, Arturo (1958). A history of medicine. A. A. Knopf. p. 274. "Abulcasis (Alsaharavius or Abu'l-Qasim) (d. c. 1013) was the author of a surgical treatise which in surgery held the same authority as did the Canon of Avicenna in medicine." ^ "Abulcasis, the pharmacist surgeon | Hektoen International". hekint.org. ^ Andrews, Esther K. (2007). Practice Management for Dental Hygienists. Lippincott Williams & Wilkins. p. 6. "Abu al-Qasim, also known as Abulcasis, wrote an encyclopedia of medicine and surgery (al-Tasrif) that is now kept at Oxford University. His unique contribution to dentistry reported the relationship between calculus and periodontal disease. He promoted prevention by recommending scaling calculus above and below the gums until all accretions were removed even if it takes multiple visits." ^ Campbell, Donald (2001). Arabian Medicine and Its Influence on the Middle Ages: Trubner's Oriental Series. London: Routledge. p. 88. ISBN 978-0415244626. Al-Benna, Sammy (29 September 2011). "Albucasis, a tenth-century scholar, physician and surgeon: His role in the history of plastic and reconstructive surgery". European Journal of Plastic Surgery. 35 (5): 379–387. doi:10.1007/s00238-011-0637-3. Pormann, Peter E. (2004). The Oriental Tradition of Paul of Aegina's Pragmateia. BRILL. ISBN 9789004137578. Retrieved 7 December 2012. Hamarneh, Sami Khalaf; Sonnedecker, Glenn Allen (1963). A Pharmaceutical View of Abulcasis Al-Zahrāwī in Moorish Spain: With Special Reference to the "Adhān,". Brill Archive. Retrieved 8 October 2014. Wikimedia Commons has media related to Abulcasis.